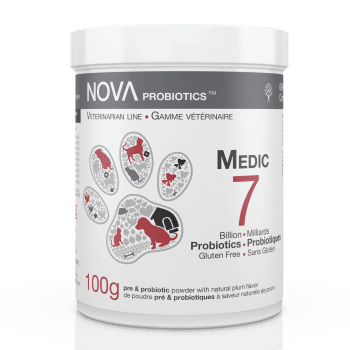 NOVAnimal presents the Veterinary line, a line conceived for your pet’s specific medical needs. The Veterinary line of products should be used short term, to get your pet through a challenging time and restore his good health. This line contains 3 products that target specific health issues, and each containing between 3 and 7 billion probiotics per scoop, 9 strains of health bacteria and 1 prebiotic. This is an effective and innovative mix that will act effectively for your pet’s health and wellbeing. These products are all flavored with natural plum, so they will be easy to slip into your pet’s diet. Your pet’s intestinal health is an important part of his overall health, and feeding him supplements will insure he regains his strength and health. NOVAnimal is here to give your pet the best care possible!